This blog is about architecture, urbanism, neighborhoods, historic preservation and other elements of the physical environment(s) of Central New York, including Syracuse and its many surrounding towns, villages, farms and natural features. Westcott Street has been hopping this summer - with lots of street life at the cafes, restaurants, the new bakery and the Westcott Theater, a popular contemporary music venue. The Save the Rain Project closed the street some days and caused dislocation, but it is now passed and finally the painted crosswalks have been replaced Life on the street is good. Westcott Street - or the "Westcott Nation" as it still sometimes called, is known visually for its murals - the biggest collection of exterior public painted and mosaic wall decoration in the city. Compared to the mural programs in places like Philadelphia, or even on 45th Street in Seattle's Wallinford neighborhood, this is small potatoes...but the neighbors of Westcott are proud and involved in their murals, so they are not to be taken lightly. In almost every way this a poplar art, made and promoted by many of the people who witness the murals everyday. 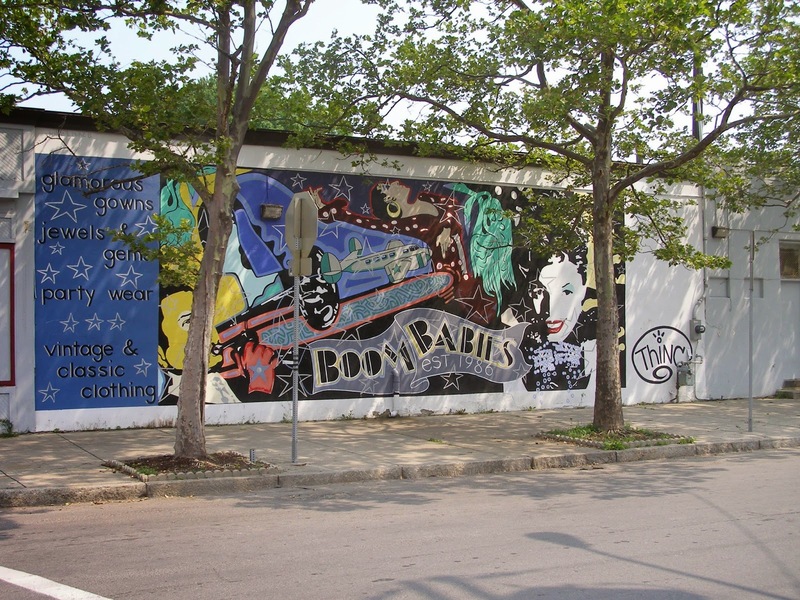 The Boom Babies Mural (above), on south wall of 489 Westcott St., is one of the most popular in the neighborhood. It was painted in 2002 by Michael Swatt and replaced an earlier work created in the 1990s. Both of the murals utilized a flat pattern language of advertising graphics and poster art to create identification with and nostalgia for past stylish decades, recreated in the vintage and exotic fashions offered by Boom Babies owner and mural sponsor Lorraine Koury. The first Boom Babies mural inspired others, initiating a what has become a tradition of mural painting in the neighborhood. 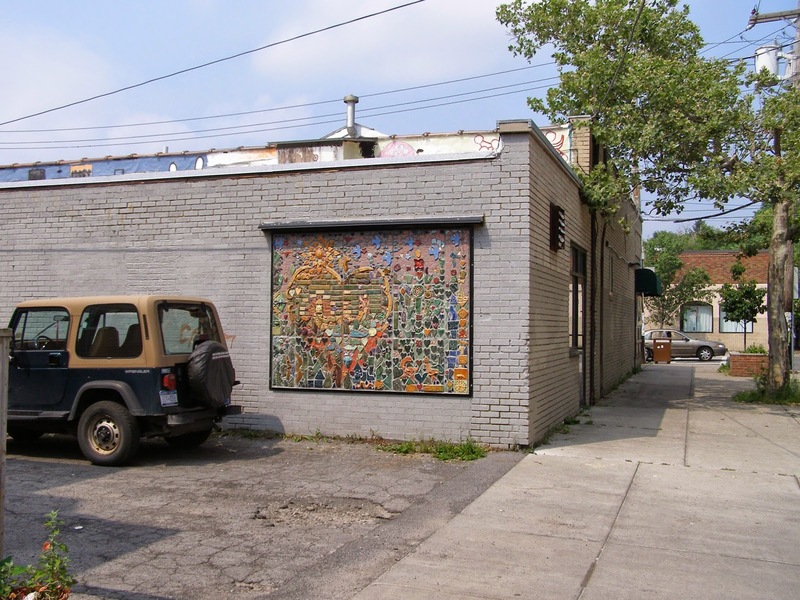 Across the street at the rear of 501 Westcott Street (SE corner of Harvard Pl) facing east, is the 6' x 8' mosaic tile mural “Heart of the Neighborhood,” designed by SU professor and former Westcott Neighborhood Association board member Marisa Temple and created by community residents, as part of a project by the Neighborhood Association and begun at the Westcott Street Fair in 1998. The mural was installed in 1999. 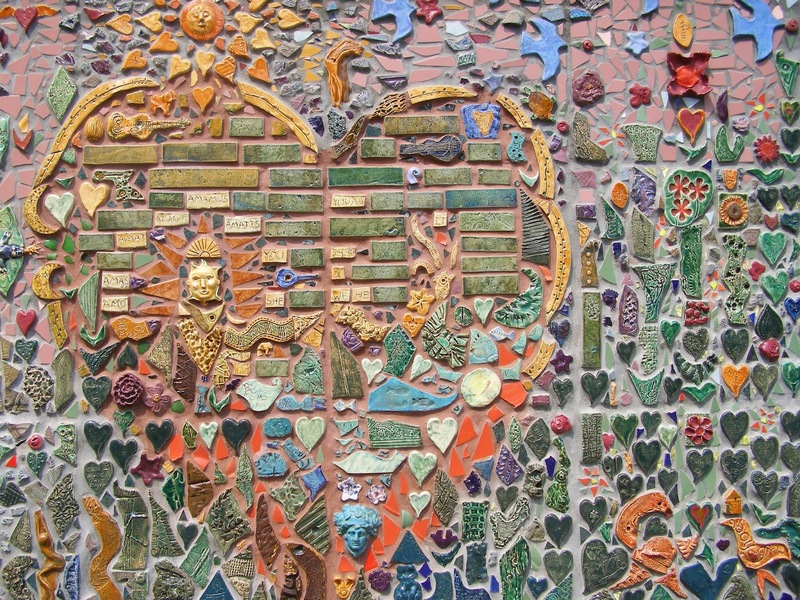 Another related mosaic mural was installed on the east wall of Petit Library in 2011. This work was a project of local artist and teacher Ann Cofer; Ed Smith K-8 School art teacher Mary Lynn Mahan; and students from Ed Smith School. The mosaic mural, is called Peace by Piece, and represents white doves against an abstract background. It is inspired by a paper cut work by Matisse; Polynesia, the Sky. Cofer and Mahan adapted Matisse's design into shapes the students could make with single or groups of tiles. About 175 students from grades three to eight worked on the mosaic during the 2010-11 school year. New tiles were created, and these were mixed with left over tiles from the 1999 mural on Harvard Place. 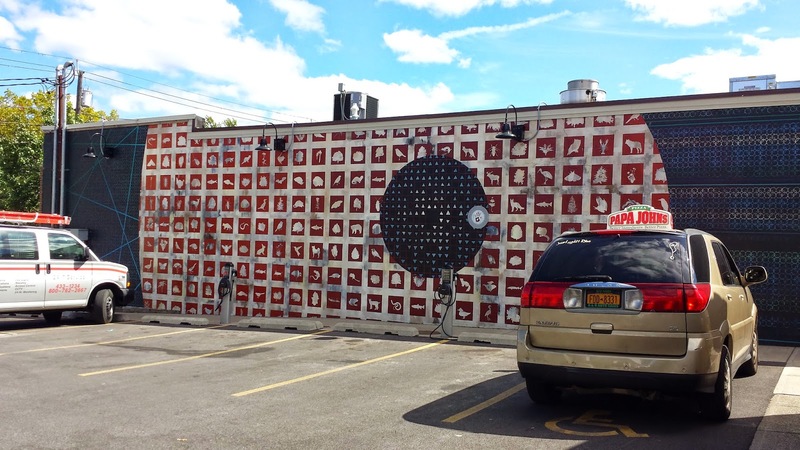 The library was an active participant in the process, as was the Syracuse Public Art program and the Westcott East Neighborhood Association which had sponsored the previous mosaic. The new tiles were filed in a kiln at Syracuse University. The mural which was made by gluing the tiles onto cement boards and was installed by city employees. It was unveiled on September 24, 2011. [see: Greg Mason, "Pieces Linked to Make Mosaic," The Post-Standard / Neighbors City (November 10, 2011). 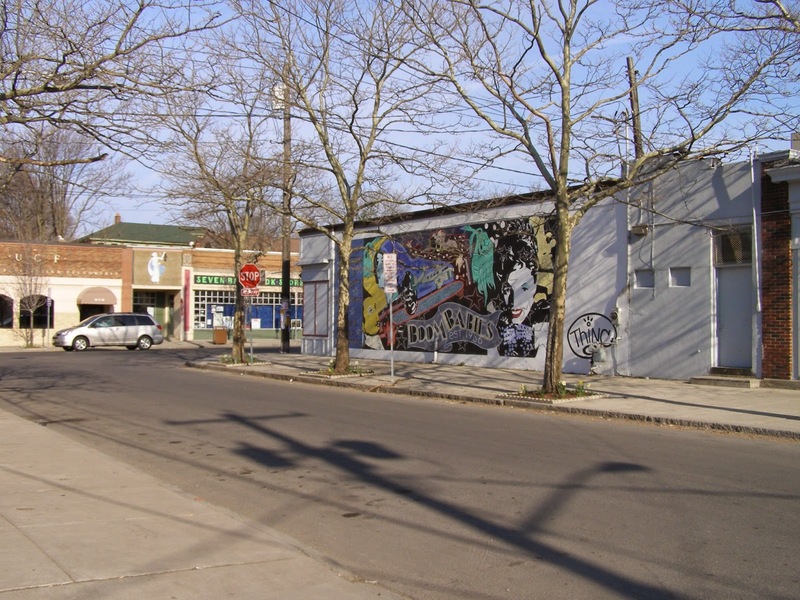 Local artist Michael Moody was commissioned by the Westcott East Neighborhood Association in 1997 to paint a mural. 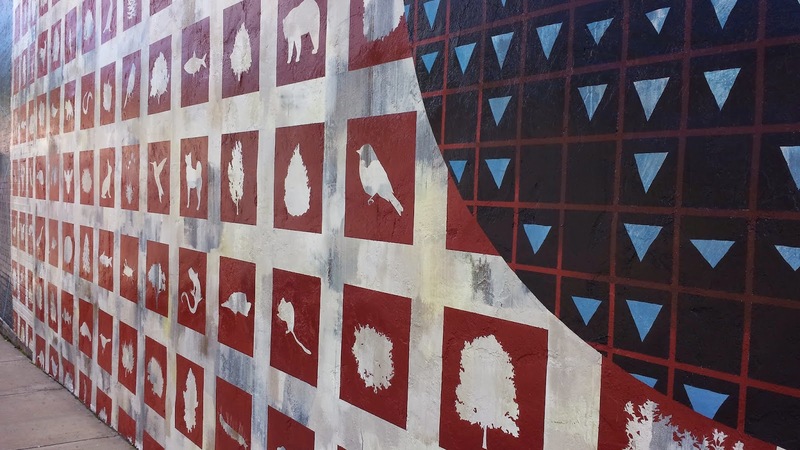 The mural was developed out of a much more comprehensive project of community involvement and planning aimed to revive the Westcott Commercial District. The scene represents neighborhood residents, including Tony DeLuca, long-time resident and proprietor of Abdo's grocery store (and father of most recent owner Ron DeLuca), who died the year the mural was completed. Abdo's, operated by the DeLuca family since 1936, was recently sold to a new owner, and the name will be changed. Syracuse, NY. Seven Rays Landscape mural by Jeff Bowe (destroyed), painted in 1990. In 1990 Jeff Bowe painted an expansive, fantastic and idyllic landscape on the side of the Saven Rays bookstore, long a destination counter-culture business on Westcott Street. Part of Bowe's work was destroyed during repair of structural damage which required removal a large section of the work. In response, in 2012 a committee of the Westcott Area Cultural Coalition, the same organization that oversees the Westcott Street Cultural Fair, began searching for an artist for a new mural on the north wall of the building that now houses the Asahi Japanese Restaurant and Beer Belly Deli. In preparation for the project the Coalition had asked residents of Westcott to answer the question “What does Westcott mean to me?” Artist Alex Biegler’s design was selected through an RFP process. Biegler, is a Texas native and graduate of Syracuse University. 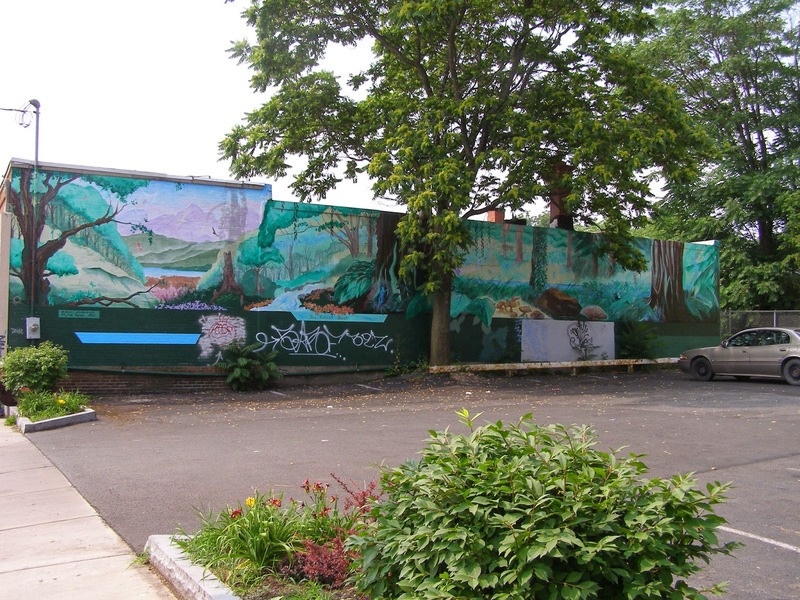 The new mural, completed in 2013, was funded by a grant from the Cultural Resource Council (Now CNY Arts) and the owner of the building. In presenting the design, Biegler wrote "the mural aims to take a universal approach by discussing the idea of community itself. This will serve both to confirm and challenge the public by providing a mirror of what they already value and connecting this value to its importance with the past, present, and future of the earth." True, this statement is pretty vague...but still in one way at least it gets to the heart of the subject matter. The mural present idealized views - silhouettes - of 139 natural forms, mostly referring to various species of tree, birds and beetles. One can view these a community of related living forms, or a matrix related visual images. Enclosing each silhouette in a box, however, recalls not a natural community - but an artificial one - that consists of the pinned specimens of entomology class. But the grid also recalls the grid of the Westcott Neighborhood, with each specimen inhabiting its own little block. The 70 feet by 14 feet mural consists of three sections: an inner circle, a second circle, and an outer section surrounding the two inner circles. Within the second circle are a series of silhouettes (the red squares) of natural organisms (plants, birds, bugs). There are no repeating pattern. Each of 139 different organisms appears once. 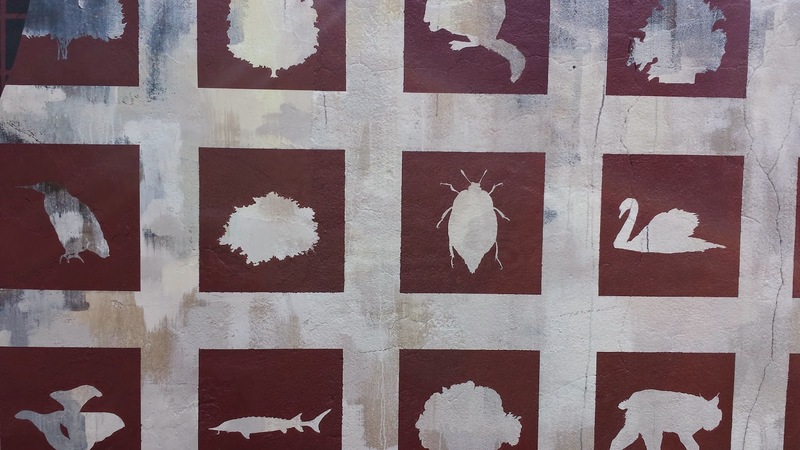 Here is list of all the organisms silhouetted in the mural - can you identify them all? More Westcott walls await. It is time to start planning the next mural. All text copyright Samuel D. Gruber. Powered by Blogger. Wednesday, Feb 5, 2014 1:00 pm (check for details) Syracuse Stage 820 E. Genesee Street Syracuse, NY 13210 Divided Loyalties: Jews and the Civil War In conjunction with performances of the play The Whipping Man by Matthew Lopez I will discuss the involvement of Jews in the Civil War - on the North and south, and something about the often ambivalent Jewish attitude toward American slavery at the time. Sunday, Feb 16, 2014 11:30 am Congregation Beth Sholom-Chevra Shas Great Synagogues of the World Jews are the “People of Book”, but surprisingly to many, they are also “People of the Building.” Given the opportunity, Jews have built beautiful synagogues for their communities for hundreds of years. Inspired by the detailed architectural accounts in the Bible, and also by their contemporary surroundings, Jews in many places have fulfilled the concept of Hiddur Mitzvah (glorify the commandment) through architecture and architectural decoration. Great synagogues have been built in Europe of since Middle Ages, but especially since the lavish inauguration of the Portuguese synagogue in Amsterdam in the late 17th century the stream of impressive Jewish buildings has continued with little interruption on every inhabited continent throughout the world. This lecture illustrates this architectural and artistic heritage with historic and contemporary images, and traces its survival in the 21st century with special emphasis on lesser known “great synagogues,” on recently restored buildings, and on some of the newest synagogues built.